Nintendo Switch Needs A Cheaper Version | Nerd Much? In an interview with Polygon, composer and programmer Yuzo Koshiro (known for his work on the first two entries in the Ys series, Streets of Rage, Sonic the Hedgehog, the first two Shenmue games, and the Etrian Odyssey series) doesn’t seem nearly as impressed with the Nintendo Switch as most others are. The console has been doing fairly well, much better than the Wii U already, and it has been praised by developers and publishers as the prodigal console of all time. Except by Koshiro. 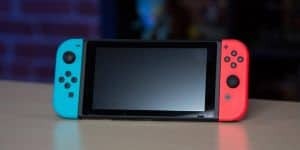 He describes the Nintendo Switch as made for games like Mario, Mario Kart, and Splatoon, to make those games more dynamic and expressive. The console is solely so that “people enjoy [Nintendo] games more.” Despite what we’ve been led to believe, Kushiro states that the company is not being very adventurous at all; over the past twenty years, the games Nintendo makes have not changed. Furthermore, Kushiro points out that if Nintendo wants to continue the success of the Switch, they had better make it cheaper or come out with a cheaper model. The only problem then, is that the console will replace the 3DS, and Nintendo has made such a strong commitment to the handheld that a lower price will likely never happen. Kushiro then reiterates that there is nothing novel about the Nintendo Switch, that it is a console made for Nintendo games and nothing else. As much as I truly love the potential of the Switch, and Breath of the Wild, I’m going to have to agree with Kushiro. The unique third party games that I have been impatiently waiting for, have not made an appearance. I do enjoy a lot of Nintendo’s games (Mario, Sonic, Splatoon, and Zelda), but they are not worth the price of the console to me. Except Zelda, Nintendo’s games do nothing innovative with the console, they don’t stand out as epic triple A titles. They are just the usual kid-friendly puzzle games and platformers I can easily find elsewhere for much cheaper and with a heavier narrative. Do you agree with Koshiro? Is the Switch doing anything adventurous? Does it need to be cheaper? Let us know your thoughts in the comments below!